Tour the Game of Thrones runs exclusively private tours while the rest of the touring companies in Dubrovnik run group departures and often with no flexibility. As such, we are always ready to customize your tour. We are pet-friendly and the pace can be adjusted to your needs. 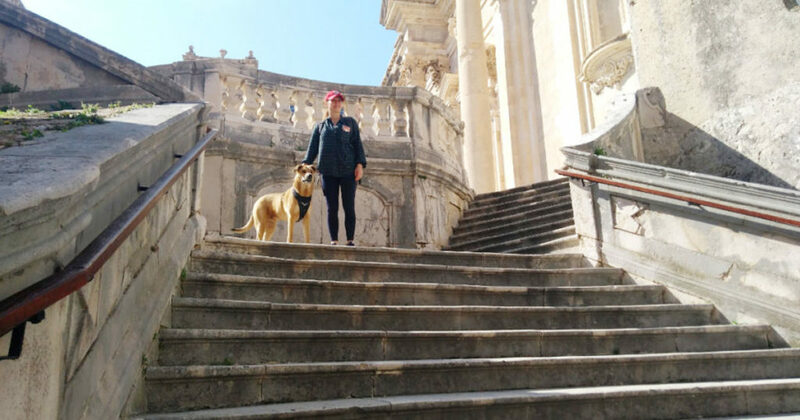 We offer personalized tours of Dubrovnik that follow the iconic locations from the popular HBO television show, “Game of Thrones.” Our tours are conducted in a friendly laid back manner and are provided by genuine Game of Thrones fans (and former extras), that are licensed tour guides for the Dubrovnik-Neretva region. Unlike many of the Game of Thrones-themed tours in Dubrovnik that run group departures, our tour is completely private. Therefore, you will have a licensed private tour guide at your disposal to pick her or her brains on the different topics, both Game of Thrones and non-Game of Thrones related. This tour is a perfect combination of facts and fiction that both fans and non-fans will enjoy. Our guides are skilled professionals that are licensed by the Croatian Ministry of Tourism and are great fans of the Game of Thrones and the Song of Ice and Fire book series. A few of our guides are even former extras from the Game of Thrones so you’ll have a chance to learn how your favorite show was filmed from first hand. We aren’t just a tour company that wants to show you where all the scenes from Game of Thrones were shot, however. We want to show you how proud we are of Croatia and your tour always includes history related to the country and how it pertains to life today. You may have come here just for Game of Thrones but we are going to educate you as well! We will incorporate Croatia history into every tour but if there is something specific you want to see, we can arrange that. Our team is offering quality private tours in Dubrovnik and the region for individuals and groups. We offer the most flexible private tours in Dubrovnik with an understanding of your preferences. There will be guided tours through the city, breathtaking photography opportunities and amazing views at every turn. Whether you are coming for just a few hours with a cruise ship or you are here on holiday, our guides will make your visit to Dubrovnik unforgettable. At Tour the Game of Thrones, we want you to have a memorable time in Dubrovnik and we want to make your private tour a one of a kind experience. Therefore, we want to cater to your exact needs so tell us what you are looking for and we will give it to you. Not sure? Let us customize it for you and your group. No matter what size your group is, our tours are always private. When you come to Croatia, let the team at Tour the Game of Thrones show you all that this country has to offer.